O’Barr, Conley and Brancato trace the common thread in the culture of pension funds in their book, Fortune and Folly: The Wealth and Power of Institutional Investing, to “an overriding concern with managing personal relationships” and an all pervasive “need to manage responsibility and blame.” Involvement by fund trustees in corporate governance issues is not yet the norm. Perhaps many fiduciaries are caught in a culture which makes it difficult to do anything but follow the herd. What will cause fiduciaries to exercise their legal responsibilities? Certainly, among pension funds there is pressure to increase income and to reduce the need for expanding employer contributions. Many of us are aware that the second round of efforts spent monitoring investments, from a corporate governance perspective, paid off well for CalPERS (see Nesbitt). However, reluctance on the part of many trustees continues. Are fiduciaries responsible to vote proxies for the exclusive benefit of plan participants? If that is a duty, is it being met? If not, what, if anything, needs to be done? I recently put some of these questions to the Pension and Welfare Benefits Administration (PWBA) and received the response posted below. My thanks to Robert Monks and Nell Minow for placing PWBA Interpretive Bulletin 94-2, the Avon, ISSI, and Lanoff letters on their LENS Academic page. (Sorry, these references moved.) I have included some of my preliminary thoughts after the PWBA response. More will follow as I give this topic additional thought and as participation in the discussion increases. This letter is in response to your September 5 letter addressing plan fiduciaries’ responsibilities for proxy voting. You asked whether proxy voting is a duty as well as a right. It is the Department’s position that the fiduciary act of managing plan assets which are shares of corporate stock would include the voting of proxies appurtenant to those shares of stock. Accordingly, the responsibility to vote proxies is a right as well as a duty. Furthermore, under the Employee Retirement Income Security Act (ERISA) a plan fiduciary is required to discharge his or her duties with respect to a plan solely in the interests of the participants and beneficiaries and for the exclusive purpose of providing benefits to participants and beneficiaries. This standard applies to all duties charged to a fiduciary including the voting of proxies. You inquired whether the Pension and Welfare Benefits Administration or any other agency has ever taken action against a plan fiduciary for voting proxies in a manner which is not in the best interests of plan participants. As of this date, no enforcement actions have been taken by PWBA against a plan fiduciary for voting a proxy contrary to the best interests of plan participants and beneficiaries. Title I of ERISA establishes standards governing the operation of employee benefits plans and includes fiduciary responsibility rules governing the conduct of plan officials and others who exercise discretionary authority or control with respect to the assets of employee benefit plans. 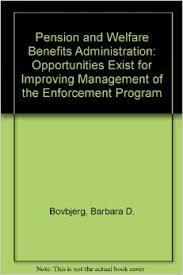 Since PWBA is responsible for administration and enforcement of Title I ERISA, other agencies would not be involved in enforcing Title I, although private actions may also be brought by participants, beneficiaries and fiduciaries under ERISA. PWBA has issued two letters, Avon and ISSI, publicly addressing questions that have arisen concerning the voting of proxies for shares of corporate stock held by plans. I have enclosed copies of these letters. In addition, the Department has undertaken two enforcement projects in 1989 and 1992, respectively, and is currently involved in a third enforcement project in conjunction with the issuance of Interpretative Bulletin 94-2. The first two projects examined investment managers and banks, with control over employee benefit plan assets subject to ERISA, and how they were exercising fiduciary responsibility in voting stock owned by the plans. The current enforcement project is examining the practices and procedures of employee benefit plan fiduciaries with respect to a number of proxy contests that took place during the 1994 season. The main purpose of this project is to determine whether fiduciaries, with proxy voting authority, have discharged their duties solely in the interests of participants and beneficiaries and with the care, skill, prudence, and diligence that the statute requires of them. You also asked whether PWBA has ever taken action against a plan sponsor for failure to monitor the voting decisions of outside managers tainted by conflict of interest. Although such potential issues have been reviewed by PWBA in some situations, to date no enforcement action has been brought by the Department. Finally, you asked if there is an interpretative bulletin explaining how PWBA will enforce the “exclusive benefit” rule with respect to proxy voting. The only interpretative bulletin issued by PWBA in the proxy voting area was Interpretative Bulletin 94-2. Interpretative Bulletin 94-2, which was issued on July 29, 1994, for the first time consolidated into one source the legal requirements for voting proxies on behalf of employee benefit plans covered by ERISA. I have enclosed a copy of the bulletin. The I.B. specifically provides that a fiduciary responsible for voting proxies is required to consider those factors that may affect the value of the plan’s investment and not subordinate the interests of the participants and beneficiaries in their retirement income to unrelated objectives. For further explanation you may want to consider a request for an advisory opinion letter or an information letter. I have enclosed a copy of Technical Release 76-1 which describes the procedure for requesting these letters from the Office of Regulations and Interpretations within PWBA. From reading the policy documents it is clear that fiduciaries have a responsibility to vote proxies in the interest of plan participants. The fiduciary act of managing plan assets that are shares of corporate stock includes the voting of proxies appurtenant to those shares of stock. However, Mr. Lerner indicates the PWBA has never taken an enforcement action against a fiduciary for failing to do so. Section 404(a)(1)(B) of ERISA requires the fiduciary who named the investment manager to periodically monitor their activities, including actions taken with regard to proxy voting. The fiduciary duties described at ERISA section 404(a)(1)(A) and (B), require that, in voting proxies, the responsible fiduciary consider those factors that may affect the value of the plan’s investment and not subordinate the interests of the participants and beneficiaries in their retirement income to unrelated objectives. However, again, it appears the PWBA has never taken an enforcement action against a fiduciary for failing to monitor or for voting a proxy contrary to the best interests of plan participants even though PWBA has reviewed some situations where the voting of outside managers was tainted by conflict of interest. Nell Minow’s Shareholder Initiatives in 1995: An Activists Perspective concludes that knowing they would have to justify their votes as investment decisions has led many more ERISA plans to cast votes contrary to management’s recommendation. This may be so but why would so many be adjusting their behavior if the PWBA has never taken an enforcement action? Maybe its not the PWBA which these fiduciaries are concerned with but I have found little evidence of private actions brought by participants, beneficiaries, or fiduciaries under ERISA for failure to vote proxies solely in the best interests of plan participants and beneficiaries. What difference would enforcement or private actions make? In my mind it would bring science into the boardroom. Decisions would have to be argued on the basis of the evidence. Let’s briefly look at executive compensation as an example. Experts in the field, such as Graef Crystal, have recommended a shift to stock options for long-term incentives rather than, for example, granting restricted stock. I understand that stock options have certain tax advantages but Mr. Crystal emphasizes that a senior executive who takes a restricted stock grant rather than an option of equivalent value is either highly risk adverse or gloomy about the company’s future. Indeed, Crystal indicates that grants of restricted stock are strongly associated with poor company performance. If the evidence of this correlation is strong, wouldn’t fiduciaries who vote such compensation packages risk enforcement action by the PWBA or a private action? If Ms. Minow is correct, that fiduciaries are beginning to realize they may have to justify their votes then, I believe significant changes are ahead. As fiduciaries realize their responsibilities, the result will be corporate governance structures and practices that significantly increase the wealth building capacity of our corporations. I have taken a quick look at PWBA’s Proxy Project Report, released on February 23, 1996. None of the three studies undertaken by PWBA involved statistically valid samples. However, when read in conjunction with the 1989 report on this subject and a speech given by then Assistant Secretary David George Ball in 1992 (no second report was issued), it appears progress is being made. ERISA section 405(c)(2) addresses the need for periodic monitoring of investment managers by those who appoint them. ERISA section 404(a)(1)(B) requires proper documentation of both the investment manager and of the named fiduciary of the plan in monitoring the activity of the investment manager. Although, PWBA uses this in the context of a requirement to maintain accurate records as to proxy voting, it seems reasonable that such a duty would extend to monitoring since, according to IB 94-2, the fiduciary act of managing plan assets that are shares of corporate stock includes the voting of proxies appurtenant to those shares of stock. The 1989 report found that 28 of 91 investment managers had written procedures with regard to proxy voting. In 1992 Mr. Ball reported that 10 of the 75 banks reviewed did not have such policies in place; 6 of those that did, either consistently gave their proxy to management of the company, or followed the traditional “Wall Street Rule” of divesting. In the 1996 findings, all investment managers had procedures to track proxies and all maintained documentation for their voting rationale. Yet, even in the most recent report, only 3 of the investment managers (out of 12) automatically report votes to their clients. “The managers who did not send their reports indicated that few clients ever requested a written report.” Only 35% of the plans could provide sufficient evidence to PWBA that they performed substantive monitoring of their delegated authority. Of those that delegated proxy voting authority, only 38% provided written guidelines to investment managers. Even of the 38%, some guidelines were general to the point of irrelevance since the guideline “vote proxies in the best interest of the client” is already required by law and adds nothing of value. Although 94-1 indicates prudent shareholder activism is consistent with a fiduciary’s obligations under ERISA, only one investment manager reviewed for the 1996 report appears to have been so engaged in anyway. In 1989, PWBA sent letters to those found out of compliance and indicated they would continue to conduct inquires and, “where appropriate” would “take enforcement action.” In 1992 PWBA found deficiencies that “may be violations of ERISA” but, therefore, found it “gratifying to note that during the course of our inquiries, 12 banks reported recent changes to their proxy voting procedures.” The 1996 report indicates “additional improvement is needed,” especially in the area of monitoring proxy votes. Although “PWBA expects the positive benefits of shareholder activism discussed in the IB…will serve the best interests of participants and beneficiaries,” the incentive of earning higher returns does not appear to outweigh the fear many pension fund trustees probably have that such involvement will alienate the members of the corporate and political communities to which they often owe their positions. Establishing corporate governance policies that can be used as guides in proxy contests is fraught with difficulty. Pension fund trustees are reluctant to get involved. If they monitor their investment manager’s proxy voting they potentially reap the rewards of reducing agency costs by holding corporate boards and CEOs accountable. However, if they do get involved, it is certain that they also run the risk that such involvement will result in severe pressures from those who appoint them or elect them to their fiduciary offices. If so few fiduciaries are bold enough to establish corporate governance policies and monitor their application, then maybe it would be a violation of “prudence” to do so. Being prudent doesn’t usually mean sticking your neck out. However, in this case it does. The law requires fiduciaries to use their senses, use their brains, and monitor to make sure they get what they pay for. A private shareholder is under no such legal obligation. Hopefully, they have the good sense to do so anyway or, if they are lucky, someone else will watch out for them and they can get a “free ride.” However, there are few genuine “free rides” in the field of either investments or politics. If the ride is a good one, somebody has usually paid the bill. If its a bad one, all shareholders or citizens pay to undo the damage done by irresponsible representatives. “The Proxy Project” concludes that additional improvement is needed “in the plans’ monitoring of investment managers to ensure that proxies are voted in accordance with their stated policies.” That message can either be “voluntarily” enforced by those that elect and appoint pension fund trustees, or it can be brought about by plan participants and beneficiaries through civil actions, or the Department of Labor can begin to enforce the law. Which action(s) will move the majority of trustees to act prudently with due diligence?